I slept in super late this morning and William made me breakfast, so let's say that the weekend is off to a great start! Aside from mounds of homework (which probably doesn't interest you), here's what my weekend looks like: the May issue of C Style (my favorite magazine), Rich&Skinny shorts and gilded J. 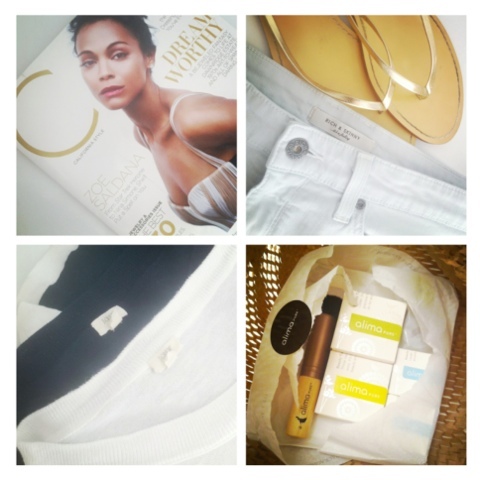 Crew sandals, Alima-Pure-hauls-are-the-very-best-hauls, lightweight cotton J.Crew Factory sweaters. In other news, William and I are going out for dinner tonight and it's 84 degrees outside! Feels like summer to me!